Home » Cattle Drives » Fun for the Whole Family! Cattle Drive Vacations Are Fun for the Whole Family! It’s a normal practice in public elementary schools everywhere to share what you did over your vacation. Whether it’s Spring, Summer, or Winter, one of the best parts of a child’s vacation is the story they bring back to tell their friends and classmates. Millions of children go to Disneyland every year. Just as many hit the beach or go skiing. Many even travel to other countries. But how many of them travel to their own country? How many of them get the chance to experience a way of life that lives in Western movies and Country music, but is so much more than popular culture can even imagine? How many of them can say that they went on a state-spanning authentic cattle drive vacation in Montana, riding alongside seasoned professionals and lending a hand to an industry that feeds millions of Americans? Are Montana ranch family cattle drive vacations a good fit for children? This is a question we are often asked at Dryhead Ranch. Our ranch vacations and cattle drive vacations are a perfect opportunity for families with children six and up to bond. Whether it be just a mother and daughter or the entire family we welcome guests of a variety of ages including children. Our head cowboy Jake and his wife Jessica have four children three of which frequently ride horses. At ages four, six and eight they are fully capable of riding a horse alongside us as we complete our daily tasks. We raise our children around horses and instill in them early how to care for and work safely around them. Our family is a family of ranchers and we have perfected the art of teaching our children safety around a horse them. This is not only our choice of how we make a living but our lifestyle. We take our children with us daily to work on the ranch and this helps them learn safety around a horse, on and off the ground. While we welcome kids six years and older it is important that parents consider whether or not their children like horses enough to ride every day for 5-6 hours. Our vacations are done on horseback and any children that join us need to have a love of horses. If a child is afraid of horses they simply aren’t going to enjoy their time with us. While we are a ranch full of exciting experiences fun for all ages most of these are on horseback. A child afraid of horses will have little to do on the ranch. We recommend that any parents desiring to bring along a young child expose them to horses before joining us. See how they interact with a horse and determine their comfortability level around it. If they show a genuine interest and lack of fear our Montana ranch family vacations may be the perfect fit for your youngster. While these vacations are great for the whole family we find that our guests often come in mother daughter duos or father son. Our Montana ranch family vacations offer a perfect opportunity for mothers and fathers, even grandparents to bond with the young people in their lives. As they work with each other to accomplish tasks the bond between these family members has a chance to grow. Cattle drives and ranch weeks are the perfect vacation opportunities for the horse loving children in your life. Horse drives require faster pace riding and are not the best fit for a child but are perfect for experienced adolescents, teenagers and adults alike. At Dryhead Ranch we value the bond of family. Our family has been brought together by the work we do on our Ranch and through our Montana ranch family vacations that we offer that to all who wish to join us. Whether it be horse drives, cattle drives, or ranch weeks we have a variety of opportunities for families to grow together while experiencing authentic ranch life. Whether you bring the whole family or just one other loved one, Dryhead Ranch is a great vacation destination for the horse lovers in your life. Call Dryhead Ranch today and schedule your Montana ranch family vacation. Everyone should understand where their food comes from, and everyone should understand the sort of people who make that food and get it where it needs to go. These are salt-of-the-earth people, rugged and adventurous, hard-working and good-hearted, just trying to make a living raising beef on the range in Montana. Sharing what they live on and live for has become a passion for the folks at Dryhead Ranch, and some of their favorite people to take out on a cattle drive are kids. It’s easy to see why. First off, there are the animals. A cattle drive in Montana offers the chance to see not just horses and cows, but also all the native wildlife of the rangeland: Coyotes, lynxs, mule deer, even Moose… who knows what you might come across in the Western wilderness? Children will love passing the time on horseback, guiding cattle while trying to spot all sorts of other creatures. Dryhead Ranch understands family. 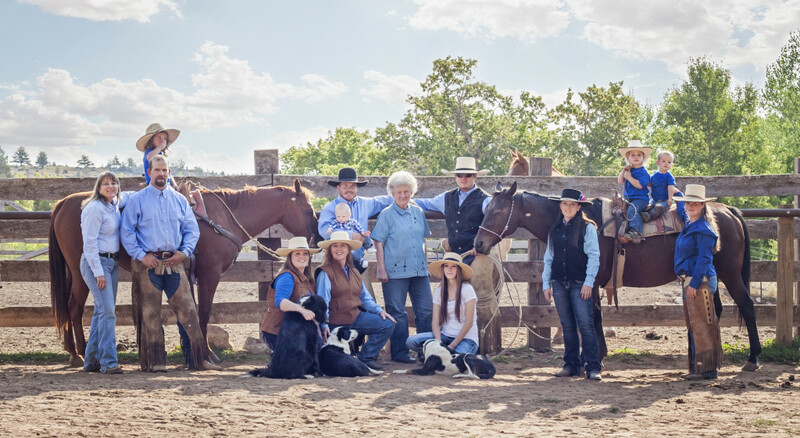 Born out of a multi-generational passion for the cattle industry, this family-ran working cattle operation is focused on a tradition that formed the country we all love. They know that part of the greatness of our nation comes from the quality of our pasture-grazed beef. That’s why they love to show visitors around and help them get a feel for the life of a real working cowboy. For the folks at Dryhead Ranch, cattle is about more than just paying the bills. It’s about building a bridge from the past to the future. Next, there’s the outdoors. What kid doesn’t like the outdoors? But this is the outdoors, cattle drive-style. Your trail boss has been doing this his whole life, and chances are any young inquisitive minds will pick up outdoor tips that will last a lifetime. Maybe, someday, they might even take their own kids on a cattle drive holiday. And of course, there are the character building experiences. This is a working cattle drive vacation, after all. Children on the drive will get the chance to prove their worth to people who know what good is. They might even mess up and get to try again. One thing’s for sure: nobody comes back from a cattle drive the same. Are cattle drive vacations are suited for beginners? The answer is a most certain “Yes!” While we recommend spending time on a horse before coming to visit us we are beginner rider friendly. Both young and old will find themselves right at home on one of our working ranch adventures; thanks to the nature of the work, there are opportunities for folks of every experience level to practice their skills or learn new ones. Our cattle drive vacations are suitable for beginners and experts alike. Come experience the real West with Dryhead Ranch! We recommend our cattle drive vacation versus our horse drive vacations. Our horse drive vacations are designed for more experienced riders. Naturally, horses are faster than cattle. Keeping up with them means maintaining a bit of a pace. Driving horses requires a more experienced rider driving cattle is perfect for the novice rider. Jake, Trevor, Jesse and Mallory, our cowboys and cowgirls, will work alongside you and teach you the ins and outs of horse riding all the while allowing you to experience authentic working ranch life. Their expert advice will improve your riding skills and help you understand where they came from. Saddle time is the best time to learn! To start with, Trevor and Mallory will pick a horse for you to ride for the duration of your stay with us. Sticking with the same horse for the duration of the drive will help you build essential rapport with the animals. Horses are naturally social animals. Even if you have never ridden a horse, humans and our favorite riding animals share a special bond developed over centuries of domestication. Our talented ranch hands will teach you to saddle and bridle your horse and adjust it for the best fit. This one horse will be the one you ride each day. You will have the wonderful chance to experience the bond between horse and rider as you work with us each day on horseback. While words can’t truly describe this bond, it is an encounter you’ll remember for a lifetime, one we want each one of our guests to experience. Once you have your horse properly saddled and bridled it’s time to ride. While you may have little to no experience this is not a problem at all. Some people are intimidated by the idea of hopping up on a huge animal’s back and hoping it goes the right direction; this is a reasonable reaction. You will learn in short order that the relationship between horse and rider is a relationship of mutual respect. Horses and cows are essentially different in that a horse is a fundamentally independent animal. The only way a horse will do what you want it to is if the horse wants to do it. This subtle bargaining between man and beast is the basis for what is one of the most dynamic human-animal relationships. As you embark on your first horse ride, Jake will spend time with you one-on-one to teach you the basics of riding. Having the personal touch of a professional rider sets our ranch apart from many others. He will ensure that your stirrups are at the right length and that you and your horse are getting along well. Horses, just like people, have personality quirks and interesting habits. Learning what these are is essential. As you ride, Jake will also teach you how to guide your horse in the direction you need to go and how to properly use the reins. This is a learn-as-you-go experience, but we are with you every step of the way to ensure your success. Anyone can learn to ride a horse. All it takes is persistence, a little dedication, and willingness to work with your animal. One thing we want you to know from the start of your time with us is this: there are no dumb questions. Questions and mistakes are how we learn. Obviously, if you have made the trip out to the ranch, you intended to experience authentic working ranch life. One of the most authentic parts about working ranch life is attending the school of hard knocks just like a real cowboy. Of course, you don’t have to go purely on trial and error. Dryhead Ranch’s team of talented ranch hands and cowboys have all been through it before. It is very likely that every challenge you will face on your vacation has already been conquered by one of our staff. If you have a question about your horse, riding, or your working ranch vacations experience please ask. It’s better to ask and receive an answer than sit and wonder for the duration of your cattle drive vacation. We are here to guide and train you and want to answer each and every one of your questions. In the beginning of your week-long stay with us, you may be a beginner rider but at the end you will have experienced the equivalent of six months’ worth of riding lessons. You won’t be a novice rider when you leave after your cattle drive vacation. At Dryhead Ranch we pride ourselves on providing authentic cattle drive vacations. The sweeping vistas and echoing canyons of the West is our playground, and we know it well. Do no miss out on your chance to live the authentic cowboy life. Our family becomes yours as you work alongside us each day. You will build memories that last a lifetime under the big sky, whether during the shining glory of the day or star-bathed majesty of the night. Many vacations offer a get-away to a cozy tropical retreat; fewer allow you to take a guided tour of history alongside men and women keeping a traditional way of life alive. Day in and day out you will experience the joys of ranch life alongside Jake, Trevor, Jesse and Mallory. We look forward to your vacation with us. Schedule your cattle drive vacation today and prepare for encounter of a lifetime. Cattle Drive Vacations For Anyone and Everyone! Dryhead Ranch’s authentic cattle drive vacations move slow enough for even new riders to keep up, our expert staff is starting to get almost at good at teaching people of all ages how to herd cattle as they are at herding cattle, and our doors are always open. Contact us to find out more about how to book the best school vacation story ever.